UPA USB-Device Programmer V1.3.0.14 for multi-cars is launched for ages and I’d like to share the installation guide in step by steps procedure and some notice tips users need to know. 1.V1.3 UPA-USB add many new ECU chip and fixed many error like “the code is not signed” error. 2.Only Window XP system supported. 3.If the uuprog software will be installed for the first time to your computer, you have to install the usb driver . 4.You also need activate UUSP before using. 3. Click”Setup” to UPA-USB Device Programmer, then follow the system guide till the setup finished. then Copy uuprog.lic file to uuprog software folder, and If the uuprog software will be installed for first time to this computer, you have to install the usb driver as well. 5. After finished, then you need to activate UUSP before using, When activation dialog is shown, click “Get Activation” button and Copy/paste obtained activation key and user name to UUPROG activation dialog and click “Activate” button. 6. 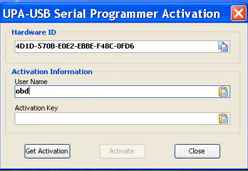 After finished, you can use V1.3 UPA-USB Serial Programmer without any problems.